Great news! 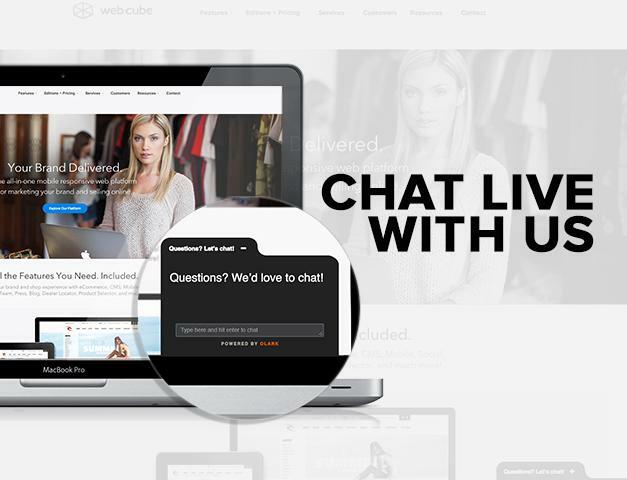 We are excited to introduce our new live chat on getwebcube.com. When you are visiting our site we want to ensure that you are well informed. With live chat available during office hours, visitors can now speak to our helpful representatives, ask questions, and get an immediate response. If you happen to visit us outside of office hours, not to worry, you can still leave a comment or question and we will get back to you. At Web Cube we want to help you grow your business - let’s talk about it! At Web Cube, we understand consumers want eCommerce experiences tailored to their needs. Today’s online shoppers expect customization, personalization and a seamless user experience that will lead them to the right product in the shortest amount of time. Brands should focus on designing the optimal mix of guided discovery to offer targeted suggestions and encourage purchases online. 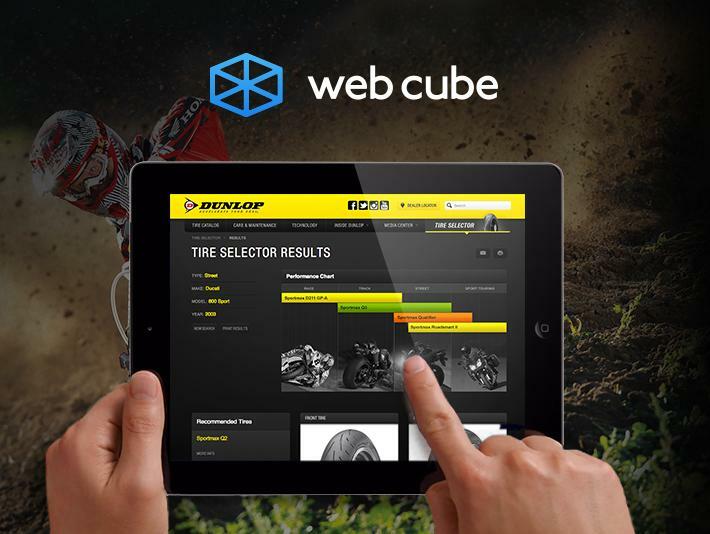 When it comes to optimizing your customers’ online experience, Web Cube has you covered. Web Cube’s advanced product selector functionality gives you the tools you need to help customers find the right size and model of the products they are looking for. Help shoppers discover your products faster, shop smarter, and leave more satisfied. The Rip Curl Wetsuit Selector allows surfers to select their gender, zipper preference, season, region, height, weight and performance features to find the right size and type of wetsuit. Surfers around the world can purchase their wetsuits online with confidence. Find your perfect fit here. Dunlop’s Tire Selector has simplified the process of selecting the correct model and size of motorcycle tires. The tire selector allows users to browse through a wide array of tires and provides instant results based on make, model, and year. See it in action here. Eldorado Stone’s interactive product selector helps consumers choose the right materials and design for their home or commercial space, with customized stonework recommendations based on design, shape, color, and regional preferences. Find the best manufactured stone products here. Join these successful brands and see how Web Cube’s advanced product selector can help guide consumers to better conversions. Here at Web Cube, we are committed to providing our customers user-friendly eCommerce and CMS features that create efficiencies in website management and empower marketers to make frequent website updates without a development team. 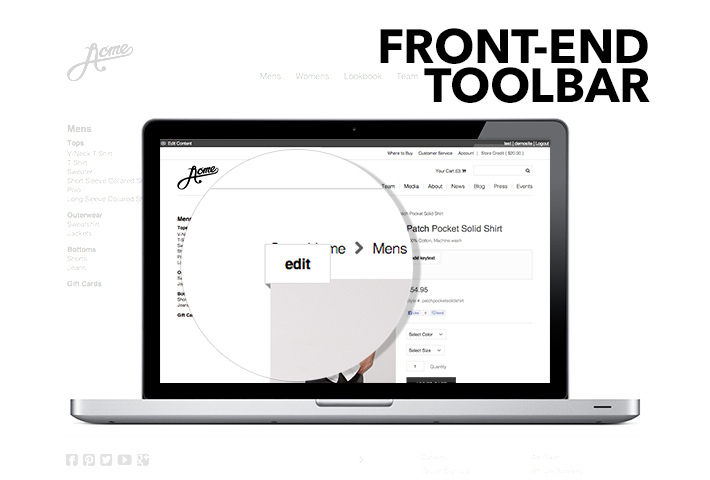 Today, we’re excited to announce the release of our latest CMS feature, the Front-End Editing Toolbar. This tool provides Web Cube users the ability to change products, blog entries, calls to action, and all other content by simply clicking each section while viewing the front-end of their site. The toolbar streamlines the editing process and eliminates the need to navigate through pages of administrative interfaces in order to get to the content you need to edit now. Want to learn more about the toolbar and the other new features released in Web Cube 4.3? Contact us today. For many top retail brands, 2013 will mark a year of increased investment in social media. Social has emerged in the last five years as a growing driver of eCommerce traffic, and analysts see no signs of slowing. Booz & Co. has found that 27% of shoppers are willing to buy through social media, and forecasts that U.S. social commerce sales will grow 93% per year to reach $14 billion by 2015. Marketers and analysts agree that Facebook remains the most promising network for social commerce opportunity. According to Gartner, a brand’s most valuable customers are their Facebook fans - compared to a brand’s non-fans, 79% of fans are more likely to purchase and 74% are more likely to recommend a product or brand. Facebook also continues to be a top source of social referral traffic to brand sites, with Facebook shoppers leading Twitter and Pinterest in page views per session and revenue generated per visit. With the recent release of Gifts, Facebook Exchange, and other tools, Facebook continues to build out the platform’s eCommerce and marketing capabilities. How can today’s most innovative retailers leverage Facebook for social commerce success? Web Cube has incorporated the latest Facebook technology to empower brands with robust social integration and selling tools. Learn how Web Cube’s social features, included with Web Cube eCommerce, can activate your customers as social brand ambassadors and monetize your social media channels. Build Facebook tabs with listings of products and custom banners, allowing your customers to click and purchase products within Facebook. Use Web Cube to build and manage interactive Facebook pages, empowering you to manage your CMS, eCommerce, and Facebook content on one fully integrated platform. Allow customers to create user accounts with their Facebook ID. Web Cube automatically populates account information fields from Facebook and enables users to leave comments on products, blog posts, and other content via Facebook. Web Cube’s built-in promotion engine allows you to reward customers for referring their friends and family to your online store. Web Cube tracks referral traffic to reward store credit to customers whose referrals resulted in a purchase. Web Cube’s Facebook Open Graph integration empowers you to deeply integrate into the core Facebook experience, allowing your users to share products and other content on Facebook’s Timeline, News Feed, and Ticker. The Web Cube team is excited to announce the launch of a new CMS feature that allows brands to showcase the pro athletes, spokespeople, and ambassadors that help build their brand – the Team Section. The new Team Section on Web Cube provides brands a pre-built, streamlined process for incorporating their brand ambassadors on their eCommerce site. Through the Team Section, users can create team or ambassador sections and organize their employees, brand ambassadors, celebrity spokespersons, or sponsored athletes into one comprehensive section. Web Cube’s Team App allows users to upload team member content, photo galleries, videos, bios, and links to their social media accounts, as well as manage multiple teams per brand. Users can also list links to their ambassadors’ favorite products from the online store, allowing consumers to easily shop for ambassador-endorsed products. With advanced content and eCommerce features like the new Team Section, Web Cube empowers brands to quickly and efficiently deploy robust, branded eCommerce stores. Here at Web Cube, we are buzzing about the new updated admin interface and improved developer support documentation announced this week, making the powerful CMS and eCommerce solution even more user-friendly and functional for leading online brands. Today, we focus the spotlight on two specific features that have transformed the way our clients command their eCommerce platform via Web Cube – the support tab and dashboard. The support tab puts a variety of help and support resources directly at the user’s fingertips. The tab includes links to Web Cube’s enhanced support documentation, empowering users, designers, and developers to master the Web Cube interface and customize and extend the product following tried and true best practices. The support tab also provides direct access to the Web Cube support team with a feedback form to report specific customer and user issues. As the entire main section of the Web Cube home screen, the new admin dashboard has revolutionized the way marketers interact with the Web Cube interface and operate their eCommerce store. The dashboard offers users instant access to their latest orders and returns, quick search, recent actions by logged in users, and shortcuts to the reports and order fulfillment managers. The centerpiece of the dashboard is the enhanced performance graph. While past users generated sales or fulfillment reports in order to gain business and sales insight, the new graph now provides an instant snapshot of the online store’s performance before the user even logs in. With a focus on integrated CMS, eCommerce, and marketing solutions for online brands, Web Cube continues to raise the bar on eCommerce platforms. Join the excitement and see how Web Cube powers eCommerce for mid to enterprise businesses. 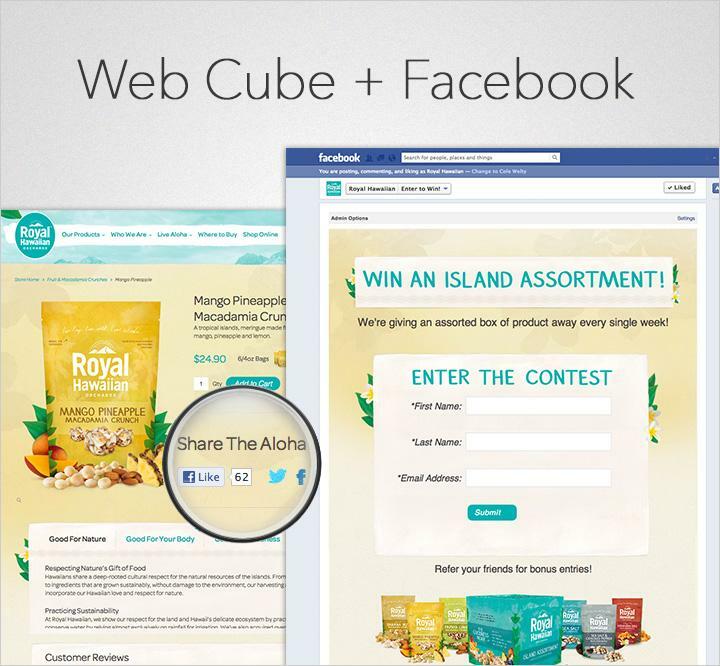 Leverage the power of Facebook to grow brand awareness and drive sales with Web Cube 4.2! SignOn San Diego recently upped their game by incorporating Web Cube E-Commerce as the powerhouse behind their revamped Daily Deals website. They leveraged Web Cube's powerful One Page Checkout, it's Facebook Connect integration and user accounts, and of course Web Cube's unparalleled flexibility to build a Daily Deals site that can list multiple deals and side deals at the same time. Web Cube is not only the engine for world class branding and E-Commerce sites, but it can be the platform for building integrated custom web applications as well. It is truly at a platform solution. At Web Cube, we are inspired by experience. Don't you love it when you go to a website and the shopping experience is polished from end-to-end? When you can easily find what you're looking for and complete the transaction without frustration or confusion? We do too. When it comes to a great customer experience, the devil is in the details. With Web Cube, we strive to make a product that provides that end-to-end polished experience for every customer that wants to interact with your brand and shop from your store. From homepage to product pages, and from shopping cart to automated followup emails, we love a smooth, unhampered experience that makes purchasing easy and intuitive. And the results of this attention to detail mean more than just happy visitors - we've seen over and over that this polished user experience translates into significant increases in revenue and average order value for our clients. Web Cube CMS is an all-in-one solution that integrates seamlessly with a wide variety of applications, including accounting, ERP, warehouse, CRM, social media, and email marketing software. From front end to back end, easy integration helps to improve workflow efficiencies and streamline your business operations. Learn how easy it is to leverage the power of Web Cube to grow your business online.